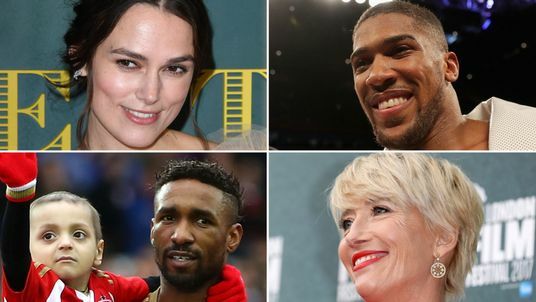 Anthony Joshua, Emma Thompson, Kenny Dalglish, Jermain Defoe and Keira Knightley are among those featured in the Queen's birthday honours list. Of the 1,057 people recognised, 71% are rewarded for work in their communities. The 519 women on the list make up 49% of the total. A tenth of those receiving awards come from a black, Asian and minority ethnic background and almost six percent of the successful candidates consider themselves to have a disability. The world heavyweight and former Olympic boxing champion, 28, is awarded an OBE for his services to sport. The former England striker, 35, seen with Sunderland fan Bradley Lowery who was terminally ill, is awarded an OBE for services to charity through the Jermain Defoe Foundation. The two-time Oscar-winning actress and writer, 59, who has enjoyed success on stage as well as in films and television, is made a dame for services to drama. The 33-year-old actress, a two-time Oscar nominee for Pride And Prejudice and The Imitation Game, is awarded an OBE for services to drama and charity.